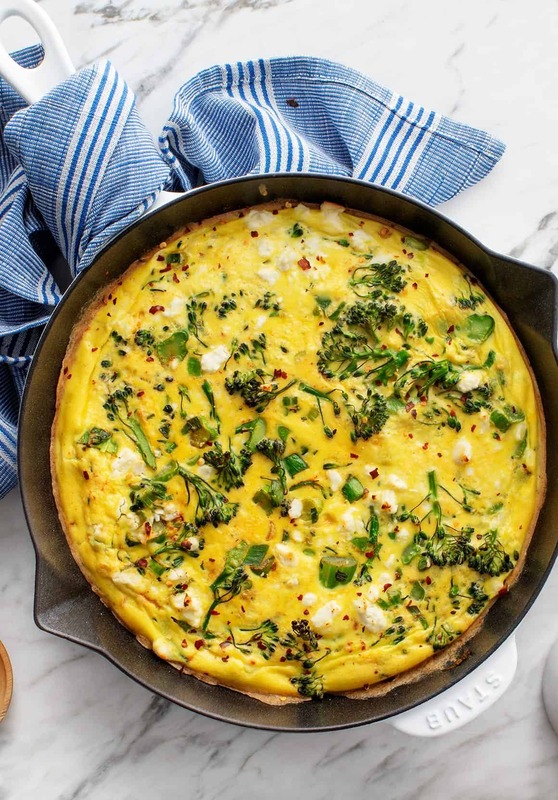 Learn how to make a frittata with this simple guide + 5 recipe variations! Perfect for any meal from brunch to dinner, they're easy and delicious. A frittata is my #1 favorite brunch item to make at home. It’s easy and versatile, so I thought with Easter coming up this weekend, you may like a frittata recipe idea… or five! I usually make my frittatas with whatever vegetables I have on hand, which means that I’ve tried a whole bunch of various combinations over the years. Below are a few of my favorites along with some tips. First things first though, you may be asking… what is a frittata? Some call a frittata a crustless quiche (although, I call a quiche a crust-full frittata). It’s an egg-bake filled with yummy vegetables, herbs, and a bit of cheese. If you’re not a savory breakfast person, it’s a quick weeknight dinner option. 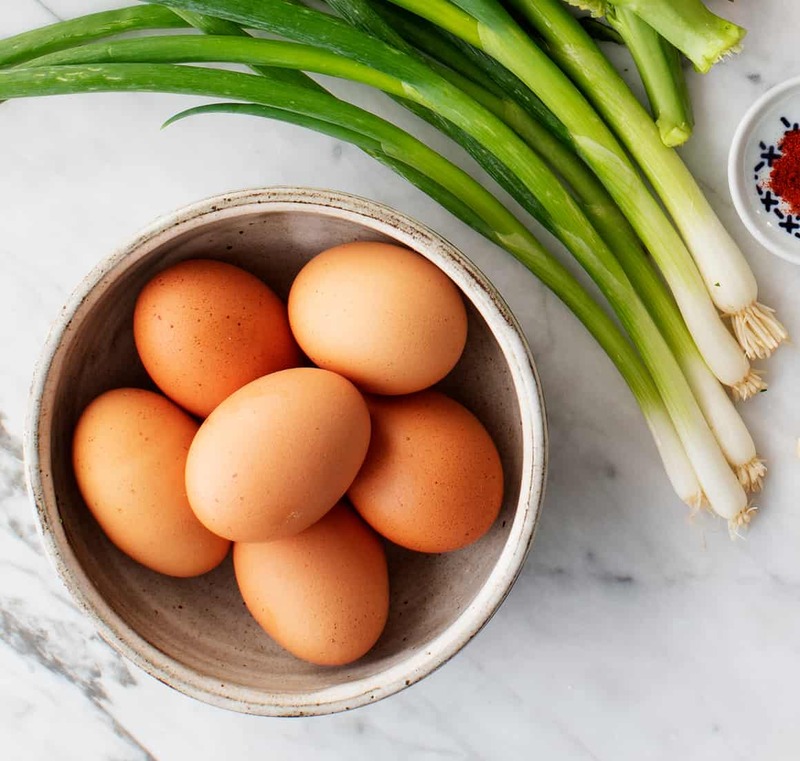 Choose a recipe variation below, and start by whisking together the frittata base: a simple mixture of eggs, almond milk (or any milk), garlic, salt, and pepper. Then, sauté your veggies in a 10 or 12-inch cast iron skillet just until tender. When the veggies are ready, stir in any spices or herbs before adding the eggs. Pour in the frittata base, and shake the pan gently to distribute it among the vegetables. Sprinkle your frittata with cheese and transfer the pan to a 400-degree oven. Bake for 15 to 20 minutes, or until the eggs are set and the top is lightly golden around the edges. Allow the frittata to cool slightly before slicing and devouring! Part of the fun of a frittata is getting creative with your vegetable and herb combinations. Here are 5 of my favorites! Spread your veggies evenly throughout the pan before pouring in the eggs. Once you pour the egg mixture in, you won’t be moving the vegetables around much (or you’d end up with scrambled eggs! ), so make sure the veggies are spaced evenly in the pan to get a final frittata with veggies in every bite. Change it up! Play around with these flavor combinations. 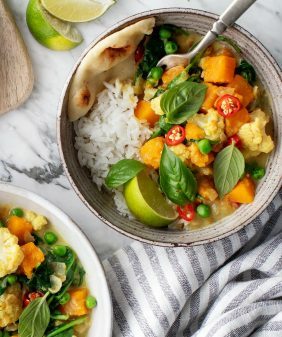 If you try swapping in different herbs or vegetables, keep in mind that a good veggie:egg ratio is about 1/4 cup of veggies per egg, or 2 heaping cups of vegetables for 6-8 eggs. Use a cast-iron skillet. The best choice for making frittatas, cast iron skillets can safely go from stovetop to oven, and they conduct heat well and evenly. Seasoning a cast-iron pan gives it a non-stick quality, so a well-seasoned skillet will result in the easiest slicing & serving. I like to use an enameled cast iron skillet, which does not require any pre-seasoning. If you don’t have a skillet, go make this breakfast casserole recipe instead. Safety first! Don’t forget that when the cast iron skillet comes out of the oven, the handle will remain hot for a while – I’ve learned this the hard way multiple times. Place a kitchen towel on it to remind yourself not to grab it before it cools off. You can also get one of these silicone handle covers. 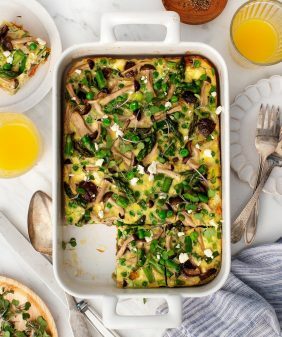 If you’re serving your frittata as part of a bigger brunch, banana pancakes or muffins, French toast, baked oatmeal, overnight oats, or fruit salad would all be great choices to go with it. 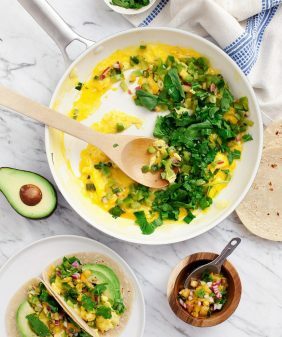 To dress up individual frittata slices, top them with additional fresh herbs or serve with sliced avocado, dollops of lemony yogurt, or scoops of tomatillo salsa. For a weeknight dinner, I like to serve my frittata with an arugula salad and some good bread. Please let me know what your favorite frittata recipe variations are in the comments. Enjoy! Here is a basic frittata recipe plus 5 easy & delicious vegetable frittata variations. Broccoli Feta: Heat 1 tablespoon olive oil in a 10 or 12-inch cast-iron skillet over medium heat. Add the scallions, broccoli, and a pinch of salt and pepper and cook, stirring occasionally, until the broccoli is tender but still bright green, 5 to 8 minutes. Stir in the smoked paprika, then add the egg mixture and gently shake the pan to distribute. Sprinkle with the feta and bake 15 to 20 minutes or until the eggs are set. Season to taste and serve. Roasted Red Pepper & Spinach: Heat ½ tablespoon olive oil in a 10 or 12-inch cast-iron skillet over medium heat. Add the shallot, and a pinch of salt and pepper and cook until translucent, about 5 minutes. Add the roasted red peppers and spinach. Sauté until the spinach is wilted, then add the egg mixture and gently shake the pan to distribute. Sprinkle with the feta and bake 15 to 20 minutes or until the eggs are set. Season to taste and serve. 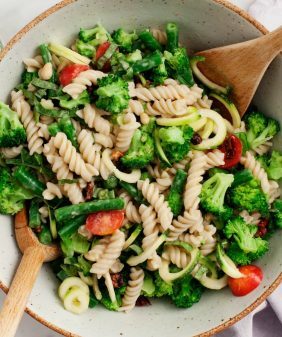 Spring Veggie: Heat ½ tablespoon olive oil in a 10 or 12-inch cast-iron skillet over medium heat. Add the scallions, asparagus, and a pinch of salt and pepper and cook, stirring occasionally, until the asparagus is tender but still bright green, about 5 minutes. Add the peas, then add the egg mixture and gently shake the pan to distribute. Add the mozzarella and feta and bake 15 to 20 minutes or until the eggs are set. Season to taste and serve. Mixed Mushroom & Tarragon: Heat 1 tablespoon olive oil in a 10 or 12-inch cast-iron skillet over medium heat. Add the shallot, and a pinch of salt and pepper and cook until beginning to soften, about 3 minutes. Add the mushrooms, stir, and cook until soft and tender, about 8 minutes, stirring only occasionally. Stir in the tarragon, then add the egg mixture and gently shake the pan to distribute. Sprinkle with the pecorino and bake 15 to 20 minutes or until the eggs are set. Season to taste and serve. Caprese: Heat ½ tablespoon olive oil in a 10 or 12-inch cast-iron skillet over medium heat. Add the shallot, and a pinch of salt and pepper and cook until translucent, about 5 minutes. Add the tomatoes, half the basil, stir, then add the egg mixture and gently shake the pan to distribute. Add the mozzarella and bake 15 to 20 minutes or until the eggs are set. Top with the remaining basil. Season to taste and serve. Hello Jeanine and thank you for this great recipe. But I decided to experiment with ingredients. I plan to add tomatoes and another type of cheese. I will let you know about the results! I wish you Happy New Year and Merry Christmas! Thanks for pointing that out – 10-inch, It could work with a 12-inch if you added 2 extra eggs. Hi Have a wonderful holiday and all the best to you and Jack (and your Shiba Inu pups) for 2019. I’m serving your vegan pumpkin French toast as part of my Christmas brunch tomorrow because there might be a minor rebellion if I don’t. Couldn’t find the star rating bit so I’m giving it FIVE STARS! Cheers from a very hot South Africa. Such a perfect healthy addition to the holiday brunch spread! This is the exact recipe I was looking for the perfect holiday brunch! Gonna make it tomorrow morning. I am sure everyone is gonna love it! Thanks for this awesome post! Absolutely delicious! I made it today for dinner and cut the recipe in half to make it a single serving, using a smaller skillet. I even had some leftover! The combination of ingredients is great, especially the use of tender broccolini and tasty feta. This is a keeper recipe! Hi Sarah, I’m so glad you loved it! Absolutely perfect. Made exactly as written in a 10-inch cast iron skillet. Will make again, next time with sharp cheddar. I took a photo, but I’m not on Instagram. Ooh, I’m so glad you loved it! Hello! This sounds wonderful! Could I bake it in a pyrex baking dish, or does it need to be cooked in a cast iron skillet (sadly I don’t have one)? 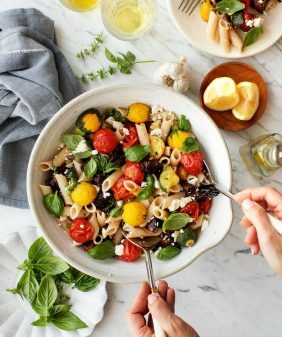 How would I need to adjust the cooking process? Hi Caroline, it should work in an 8×8 baking dish. Brush the baking dish with olive oil. Cook the veggies in a separate skillet over the stove (as the instructions say), then transfer them to the baking dish. 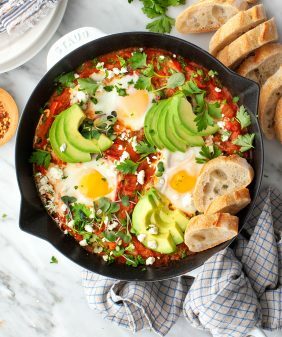 Pour in the egg mixture, shake the pan a little, top with feta and bake until the eggs are set – should be around 20 minutes. Hope that helps!! You could halve all of the ingredients and cook it in a 5-6-inch mini skillet. Or make the whole recipe and save the leftovers for the next day, they reheat well! Came out great and was super easy to make 🙂 Definitely my new favorite!! Delicious recipe and so easy to make. Thank you for this.